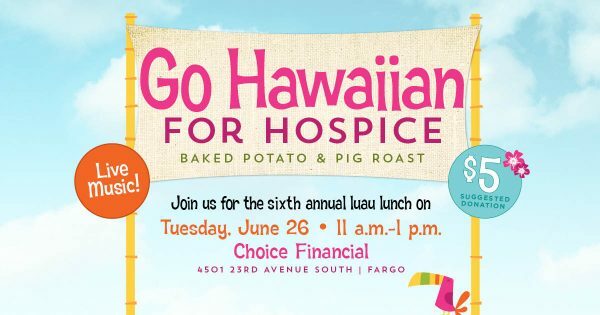 Choice Financial invites the community to the sixth annual “Go Hawaiian for Hospice” luau lunch in support of Hospice of the Red River Valley on Tuesday, June 26 from 11 a.m.-1 p.m. For a suggested donation of $5, attendees will feast on a pig roast, baked potato, fresh pineapple, Hawaiian Punch and a frozen treat, with all proceeds directly benefitting Hospice of the Red River Valley. Last year, approximately 2,300 people attended the event; as a result, Choice Financial presented Hospice of the Red River Valley with a check for $134,146. In 2017, Hospice of the Red River Valley cared for 1,733 patients on their end-of-life journey throughout 29 counties in North Dakota and Minnesota. The Go Hawaiian for Hospice luau fundraiser helps provide funding for Hospice of the Red River Valley to offer end-of-life care for terminally ill patients and support for their families. As a local not-for-profit, community-based organization, Hospice of the Red River Valley provides care to anyone who meets the medical guidelines for hospice care, regardless of insurance coverage or ability to pay. Donations and community support make this possible. WHEN: Tuesday, June 26, 2018, from 11 a.m.-1 p.m.